Park Hyatt Saigon strives to preserve old Saigon’s elegant charm, from the bright ivory façade to colonial interiors tinged with Oriental touches. Part of the prestigious Hyatt Group, the stylish hotel overlooks the Opera House in the heart of downtown. The 252 guest rooms, including 21 suites, offer city or pool views and feature traditional and modern touches: louvered windows, timbered floors and sound-proofed windows, as well as four poster beds, flat screen TV and high-speed Internet. Chic bathrooms feature walk-in cubicles with tropical rain showers. 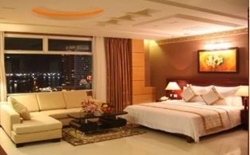 This well-known and luxurious Boutique hotel is located in the heart of Ho Chi Minh City. It is in close proximity to the main shopping areas of Dong Khoi and Nguyen Hue Street, and within walking distance to Saigon River, the People’s Committee Building as well as other major sights of interest. After its latest renovation in the end of the year 2006 the total of 144 guestrooms and suites appear in contemporary design featuring the signature floor with express check-in and check-out services. Inaugurated in the end of 2008 this hotel now belongs to one of the leading 3-star Boutique hotels. Ideally located for business and leisure travelers, Northern Hotel is situated in the city centre of Saigon; close by to major tourist sights, restaurants, shops and all the cultural and night life the city has to offer. Guests are hosted in a total of 99 rooms and suites that are set up in simple minimalist style. To offer optimum luxury, the rooms are equipped with Jacuzzi facility and other internationals standard amenities such as satellite TV, IDD phone and air-conditioning. The latest five-star accommodation to grace the capital city, the stunning InterContinental Westlake is set entirely over the waters of historic Westlake and adjacent to the 800-year old Golden Lotus Pagoda. 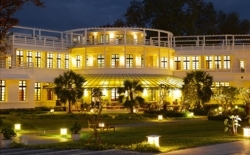 The unique location gives the impression of a luxury resort than a stylish urban hotel. The hotel’s 340 stylish guest rooms and 19 suites are spread out over the t-shaped main wing and three island pavilions, both low rise and blending harmoniously with the serene waters of Westlake. The five-star Sofitel Metropole Hanoi is not just a premier hotel in the capital – it is also a celebrated historical landmark. As well as an impressive example of French colonial architecture – with its classic white façade and exquisite chandelier-lit lobby – the former Grand Hotel Metropole Palace is drenched in Hanoi’s momentous history. Restored to its century-old charm, this was once the elegant epi-centre for colonial society and one of South-east Asia's greatest hotels. Here, invading, liberating or civil armies – as well as heads of state and embassy officials – have decamped over the years. Heaving with anecdotes, the glittering guest list includes Noel Coward, Somerset Maugham, Charlie Chaplin on honeymoon, Jane Fonda during her infamous “Hanoi Jane” broadcasts to US troops and English writer Graham Greene, writing some of "The Quiet American" novel. The Graham Greene Suite and namesake cocktail honours his stay. The 265 charming rooms and suites in the Old Wing or newer Opera Wing evoke a bygone era. Beautifully appointed, they feature double glazed windows, outrageously comfortable beds and modern bathrooms with personalised touches. 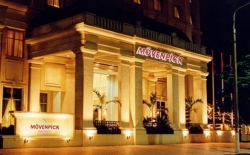 The Movenpick Hotel Hanoi is conveniently located in the heart of Hanoi business district, a 40-minute drive from Noi Bai International Airport and only 5 minutes from the city centre. The hotel is specially tailored to meet the needs of discerning corporate travellers. The hotel offers 154 well-appointed rooms and suites, 93 of which are non-smoking rooms, and 20 connecting rooms. All rooms are equipped with fully equipped amenities and modern decoration. Broadband cable and WiFi Internet is accessible in all guest rooms and throughout the public areas of the hotel. 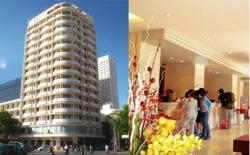 Situated in the lively heart of Hanoi capital, Star View hotel enjoys a truly stunning location, offers the ideal accommodation choice both for business or leisure travelers with a superb combination of comfortable accommodation, great value rates, versatile amenities and an excellent central location. The Zephyr Hotel Hanoi boasts an unparalleled inner city location providing easy access to many key attractions and major transport links as well as stylish shops, restaurants and cafes. 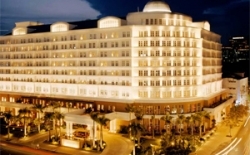 This 3-star hotel features extra amenities and services set in stylish and charming surroundings. The hotel offers 43 finely decorated spacious guestrooms each configured with modern amenities to ensure a pleasurable stay. Newly rebuild and refurbished Thang Long Hotel offers its guests a charming interior with all the expected comfort of a 3-star boutique hotel. 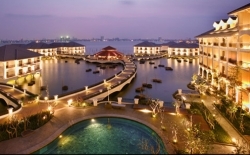 Thang Long is conveniently located right in the heart of Hanoi’s commercial, business and administrative district and only a stone’s throw away from the major sights such as the Opera House. 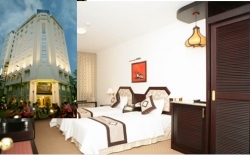 71 rooms including suites provide guests with extensive international services and facilities. All rooms are equipped with air conditioner, ADSL internet access, direct dial telephone, satellite TV, mini bar. One of the few monumental hotels now operating in Vietnam, this Hue landmark is more than a place to sleep – it is a destination in its own right. Built in 1930 as part of the French Governor’s official residence in the former French colony of Annam, the hotel’s bowed façade, long horizontal lines and nautical flourishes are hallmarks of the Streamline Moderne School of art deco architecture. Bao Dai, the last emperor of Vietnam, was once a guest; so too was King Bhumipol of Thailand. Inside, the hotel’s colonial-era ambiance is evoked by a fusion of art deco styles that draw from the 1920’s Jazz Age to the end of the colonial era in the 1950’s. In three, linked buildings, the hotel’s 122 guest rooms and suites blend age-old charm and Asian opulence, with louvered shutters, hardwood floors and lofty ceilings.